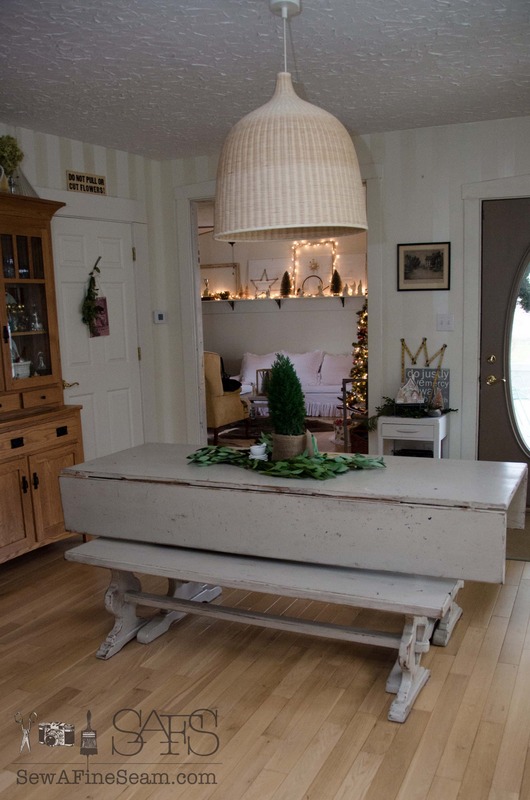 I almost nixed my plans for a Christmas House Tour. There are so many house tours out there that are so much more beautiful than mine. It’s easy to fall into feeling like it’s not worth posting because mine will never measure up. And the weather was NOT cooperating this year. We’ve had almost no sunshine lately and not even cloudy days that were still bright enough to make indoor photography look good. And I’ve been so busy making pillows to get shipped out I really haven’t had time to do all the stuff I wanted to my house. Like paint the walls and the piano and the kitchen cupboards … and on and on. But then I decided that I was being silly and I needed to just share anyway. If nothing else I can share with you all that you can create a cozy space that you love to live in even if it doesn’t measure up to the bigger, better homes out there. So. 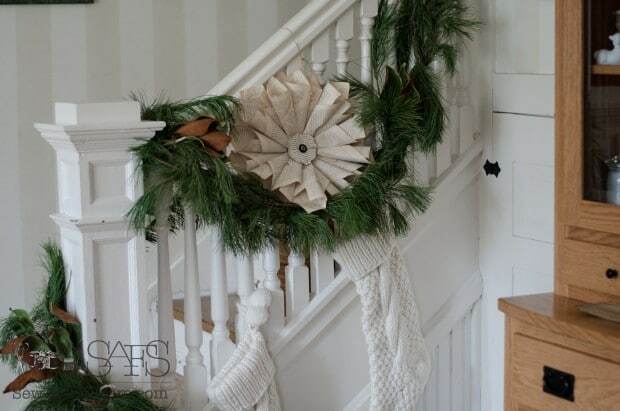 Welcome to our humble abode – all decked out for Christmas. 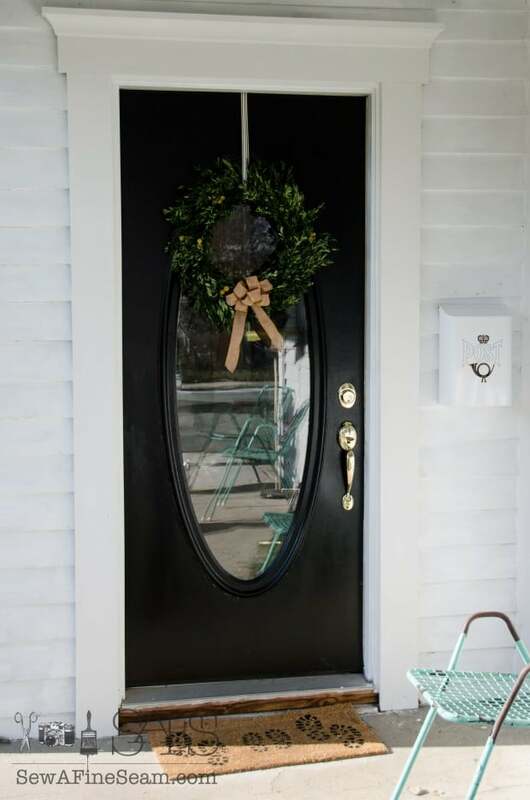 The wreath on our front door, and all the fresh greens I use, came from my friend who has a florist business, Consider the Lilies. 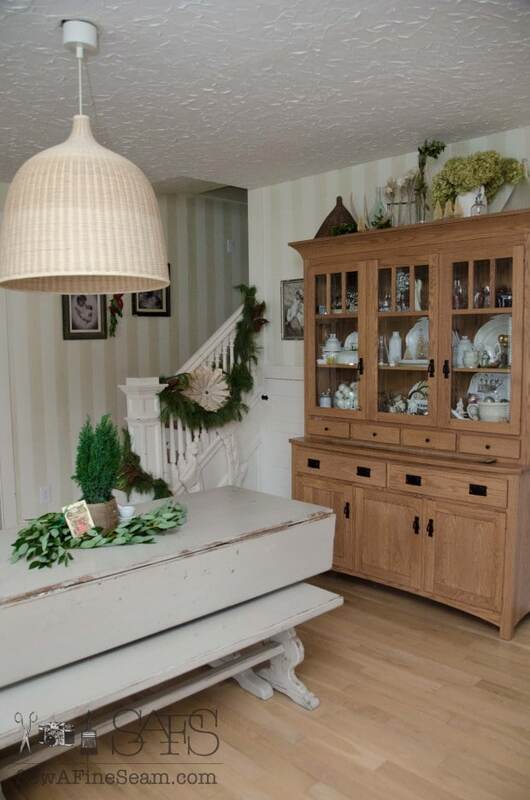 Just inside the front door is the dining room. This nook is always fun to decorate for Christmas. This year it houses my Fontanini Nativity set. Fresh bay on the curtains this year. 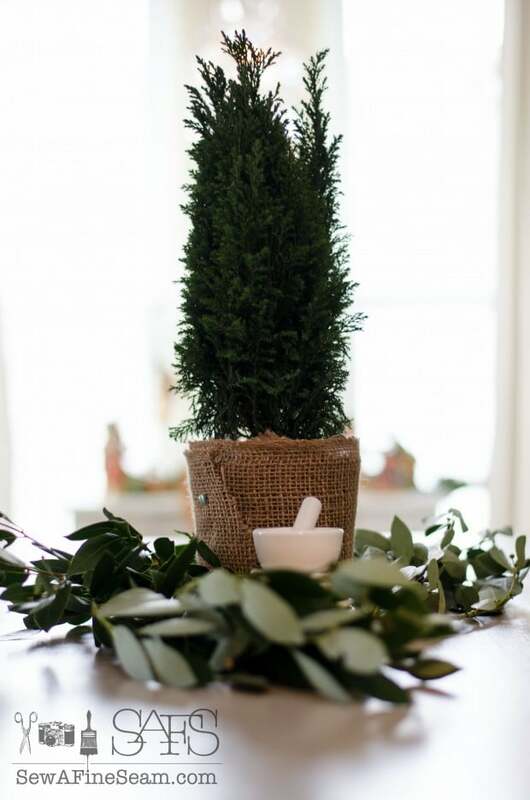 I have always used mainly boxwood in the past but this year I went with bay and I love it so much! Stairway has pine roping and some magnolia leaves tucked in. Green plant on table came from Trader Joes and I added some fresh bay and a stack of ironstone butter pats and a tiny mortal and pestle. Mr. Deer is wearing his scarf from last year. And he’s been joined with some woodland friends all nestled in a sheepskin from IKEA. Small pumpkin candle I found after Thanksgiving at Target on the clearance shelf. I thought it worked in nicely with Christmas with the gold stalk. From the dining room we can see into the living room and get a peek at all the lights and the tree. Our tree is loaded down with vintage ornaments and my blown glass ornaments. Across the room in the cupboard in the corner I struck lights through and added a few Christmas pieces and ornaments to what was already there. My wooden horse is new and is my new favorite. I love how he looks in front of the lit cupboard. I just bought the cowhide rug at IKEA. I’ve looked at them for years and wanted one for even longer! I’ve seen $400 all white cowhides that I dearly wanted to bring home from flea markets. But since that wasn’t in the budget I refrained. And at IKEA I never had found one that begged me to take it home. This time one did. And my teenager was with me and she loved it too and insisted I should get it. And it was on sale. And my teenager folded it up and put it in the cart – and it wouldn’t budge till we go to the register. So I paid for it and brought it home. And I don’t regret it! I love my pillow from Lucy at Craftberry Bush. I just ordered another one from her and it’s adorable too – can’t wait to get it. 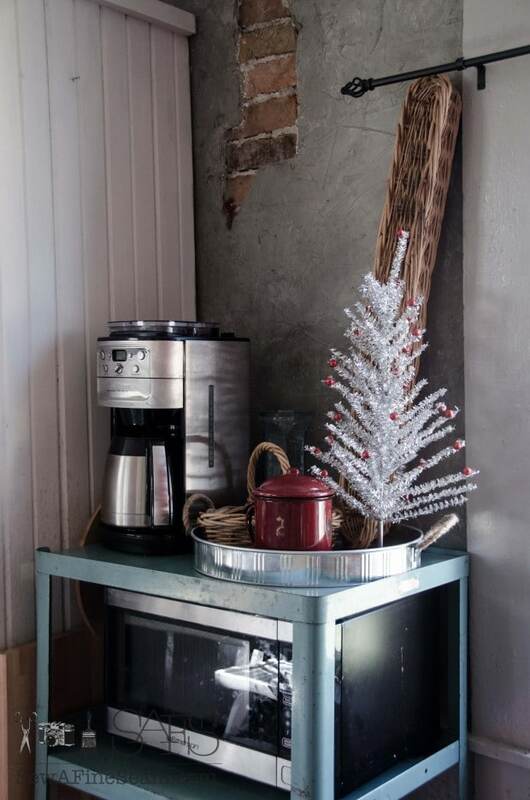 I added a couple bleached bottle brush trees to my metal cabinet side table to make it festive. Through the other side of the dining room you can go into our kitchen and my work room. The lockers in my work room hold the girls school work. I added a bay garland and some magnolia leaves to the top. 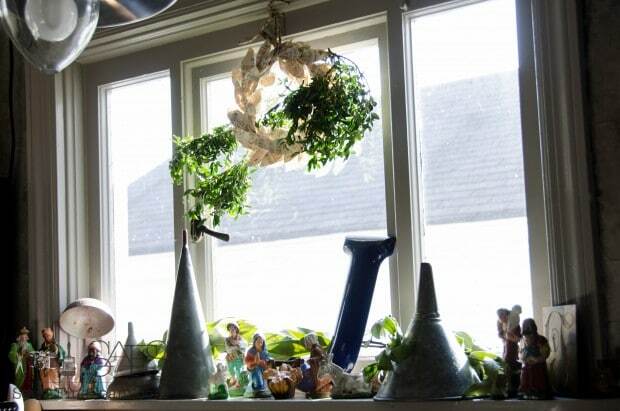 My kitchen windowsill holds vintage funnel ‘trees’ and a vintage nativity. 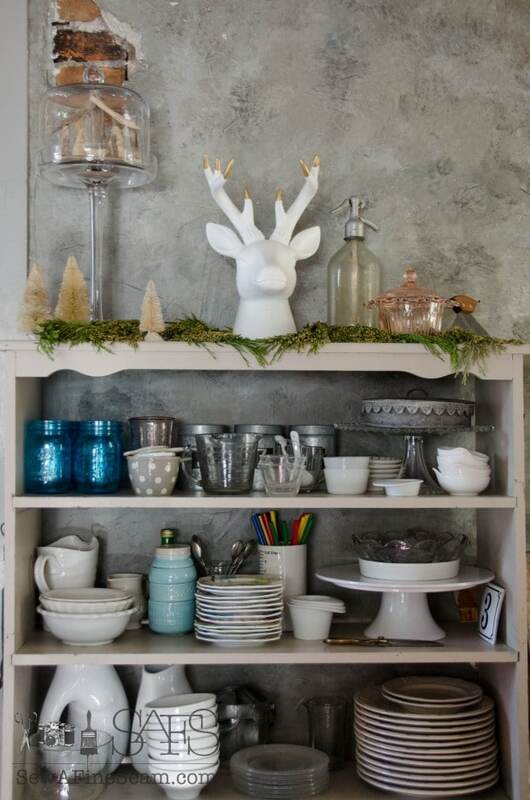 My open shelving was straightened and Christmas decor added to the top. 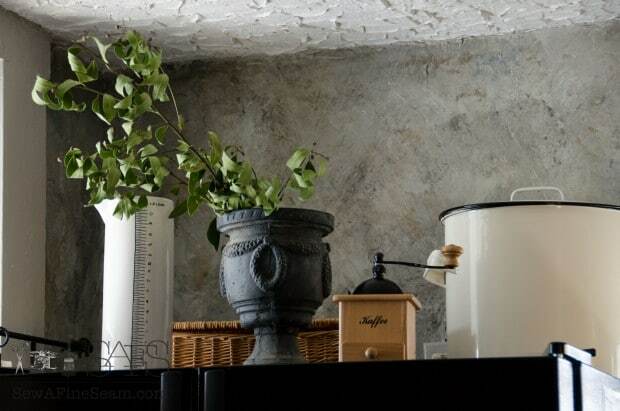 I added an urn with a branch of bay leaves to the top of the refrigerator. Simple but it makes it a bit festive. I found this little silver tree at Target and couldn’t leave it there. I like the pop it adds to our coffee station. I’ll share more later – my table centerpiece, more photos of my wood horse, and the tree. Thanks for coming by and I hope you enjoyed the tour! Jill, your house is beautiful!! I would have been disappointed if you had decided not to share. 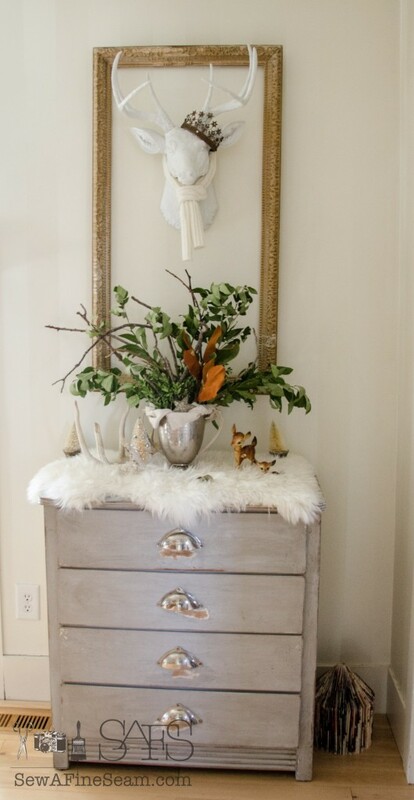 I love your natural touches to your Christmas décor. Love it all, Jill! Where do I begin? Love your new cowhide rug! Great choice. 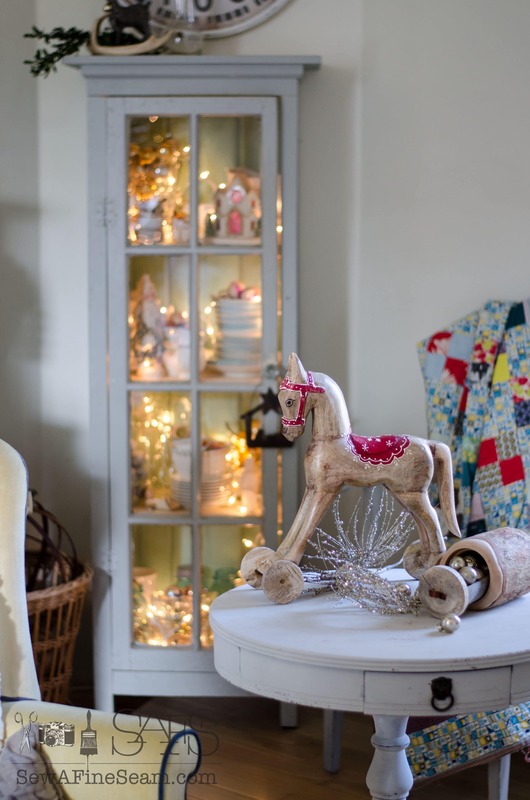 The cabinet with the lights is just dreamy and I too love your wooden horse in front of it! 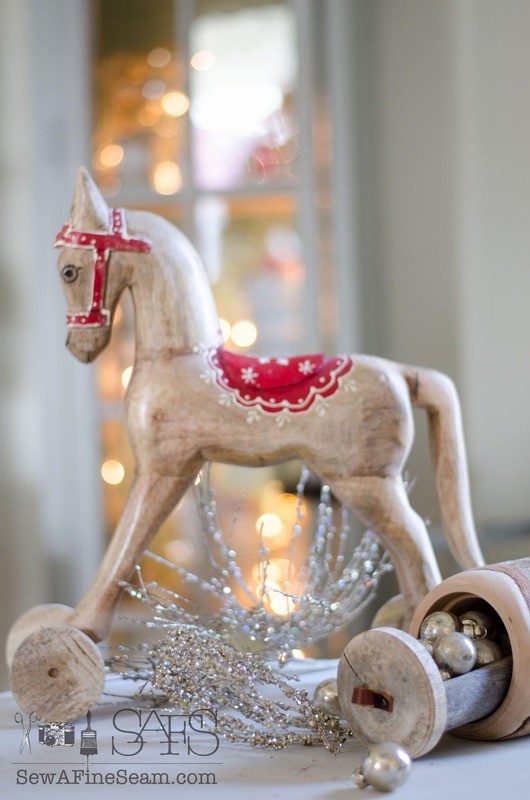 What’s the little round thing next to the horse holding the mini ornaments? That’s just adorable! 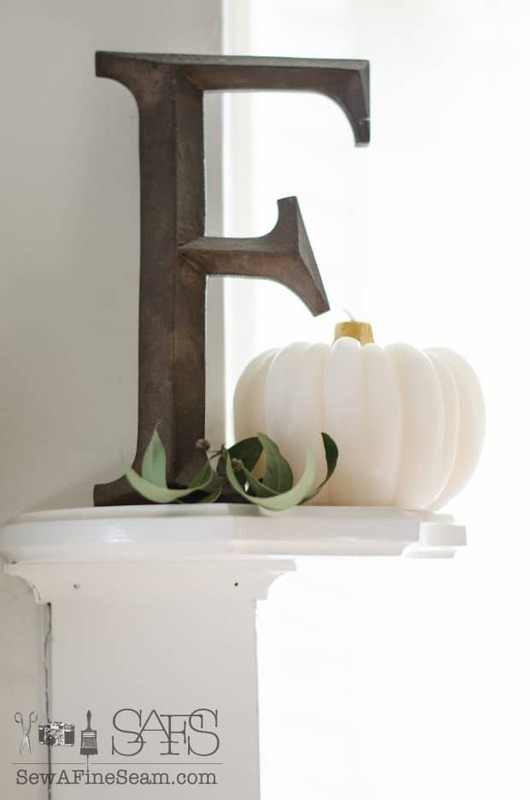 Love all your greenery (I need to go to Trader Joes) and the pillow from Lucy is fab! I have one too … the red VW bug with the tree on top. Love the vignette with your hubby’s childhood truck. 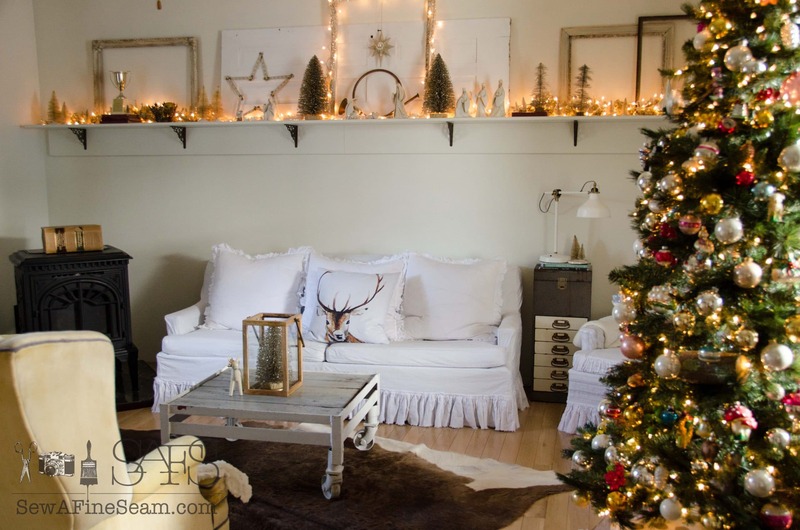 It’s all so pretty … I’m glad you decided to do a holiday home tour! Thanks so much Jennifer! 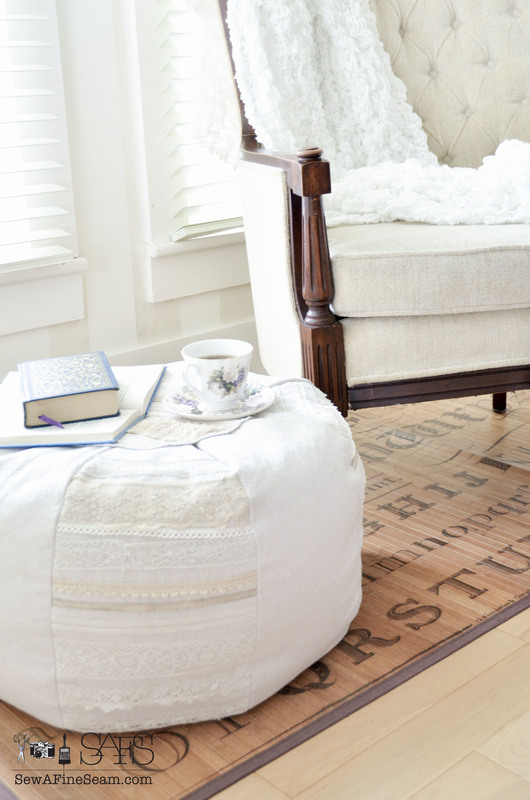 I may take the typography rug and use it at my shop now for awhile – they look really cute in shops I think! Laura you are too sweet! Thanks so much! I’m glad you shared your home. You did a wonderful job. I especially love how you used fresh greenery. I bet your house smells wonderful. I remember all those dark days we could have when I lived in Cleveland (Westlake). I’m glad those days didn’t keep you from sharing your house. Thanks Nancy, yes, it has been quite dreary lately – trying to keep coping! Your home is beautifully decorated and I’m so glad you posted this. Love the bay leaves! Thanks Betty! I’m really loving the Bay leaves! So glad you showed your own beautiful home! I love your style. I want the red locker that I see reappearing from time to time on your posts. Thanks Shilah! I love those lockers! They hide the mess of school books and all the stuff needed for homeschooling! Jill, I love the cozy feel of your home. It’s what I strive for in mine. I especially love the sentimentality of using your husband’s toy truck! Merry Christmas! Thanks Diana! I love using the truck too! 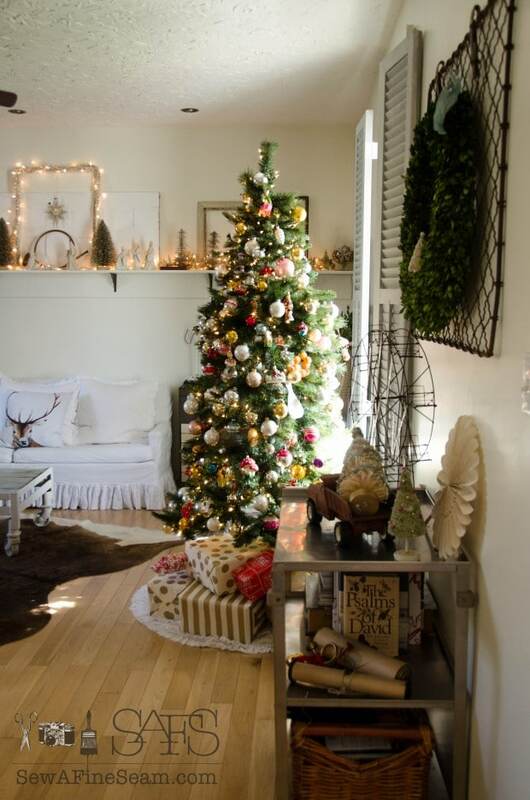 Your home is just so warm and welcoming…and it looks so beautiful all dressed up for Christmas!! I’m so glad you shared your home with us. 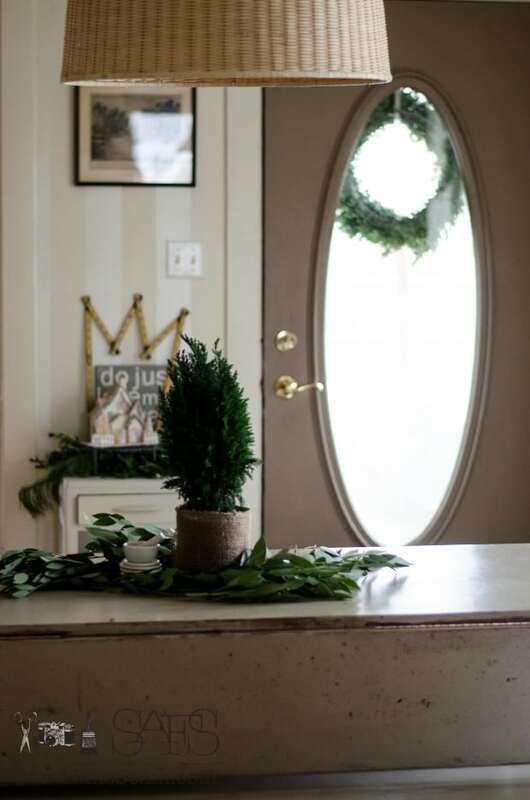 No decorating here (for like the 3rd year in a row) so I am enjoying the bloggers who are willing to let me peek into the Christmas goodness in their homes! Thank you Susan! Have a wonderful Holiday! Your house shows you have a real life. It shows imagination and using what you have,not what you ran out and bought!!! Anyone can do that. MERRY CHRISTMAS, GOD BLESS!! Thank you Carol and Merry Christmas to you too. So festive! Your home is gorgeous – and every bit as lovely as any house I’ve seen! 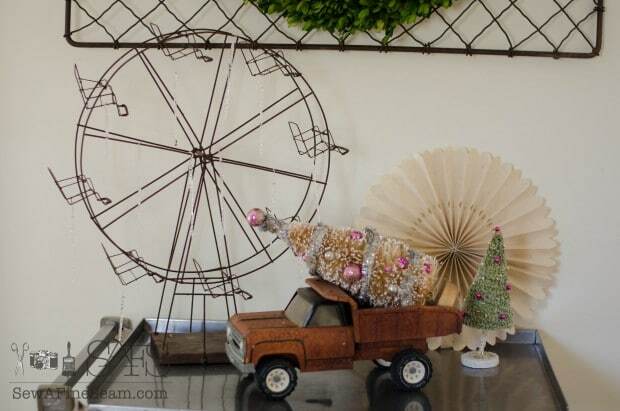 Love your vintage touches and that cute little truck! Thank you Kelly! I just keep seeing all the things I wanted to get done and haven’t had time for and in my mind I see what I want it to look like! You have a lovely home, Jill. 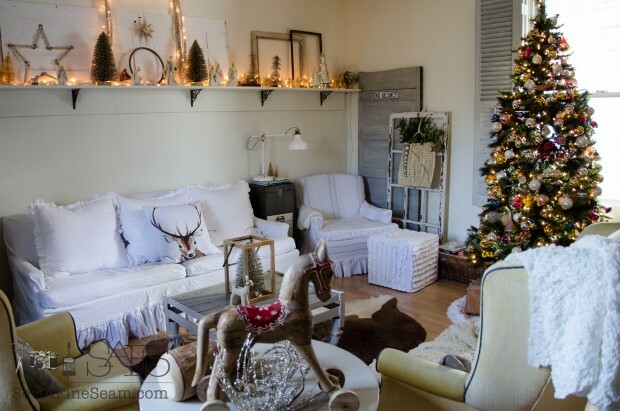 I love the way you have decorated it with greens & the vintage nativity. The wooden horse is a favorite of mine too. I haven’t gotten around to doing any decorating yet as my husband & I are painting & still dealing with remodeling. We are supposed to have the cooking range delivered tomorrow & I just got the space ready for it tonight. Right now my home looks like a flop house 🙂 I hope to put up the tree soon if I can find it in all the mess. God bless you & your family. Have a great Christmas! Simply beautiful! 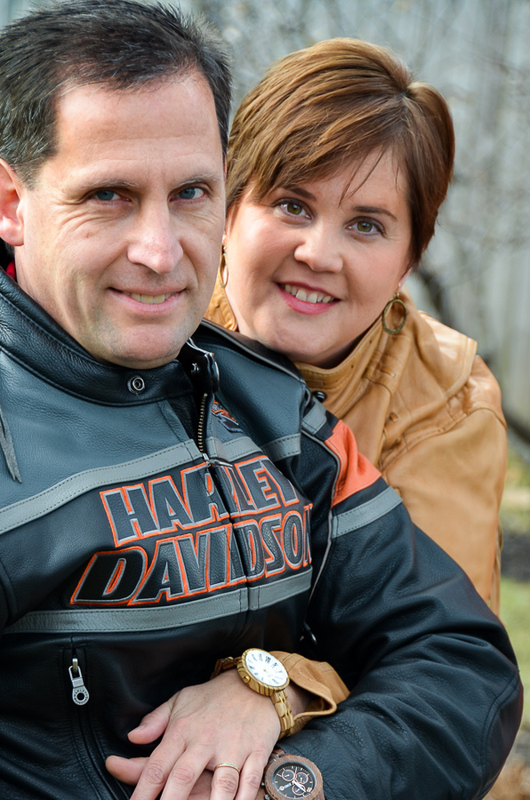 Always enjoy reading your blog! God bless you Jill! Thanks Debbie! Merry Christmas to you! merry Christmas. what a lovely home. your photos and explanations are so thoughtfully arranged. it truly felt like you were walking me through the home. Thank you Brenda! Merry Christmas! Gorgeous! wishing we had folded up one of those cowhide rugs when Cait and I were at Ikea too! 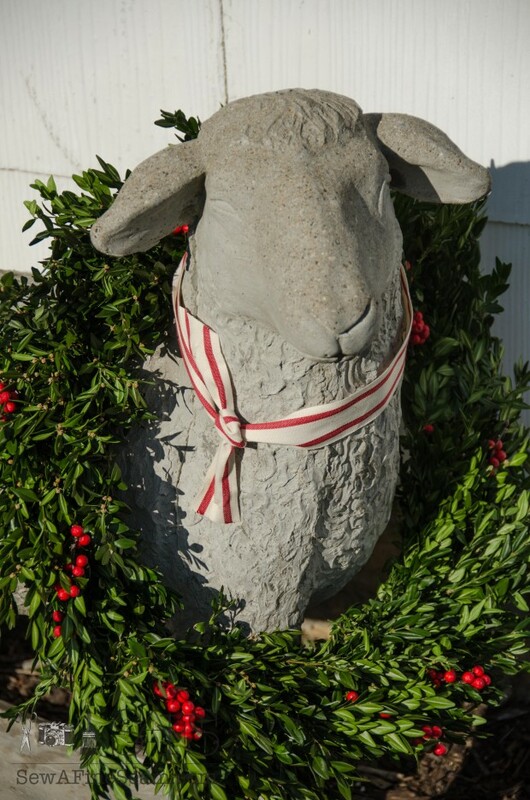 We stood and petted them for quite awhile lol Today we finally go cut our tree and will start decking the halls … as a retailer, the shoppe always comes first and seems like our house gets a little neglected…you were smart to do yours early =) Enjoy! Hi jill. These few relaxing moments on my sofa with lap filled Yorkshire before I lead a piano recital this afternoon, were just what I needed. Your love of doing is what shines through in this post. People always say how do u have time? It’s because it’s not work. It’s a creativity flow to make beauty. It’s taken me many years to understand that. You are a blessifg to many. Real Ness. Transparency. Giving what you love. Thank you. I think your home looks so warm and inviting, Jill. I think most of us do some of that same processing and fretting over whether our home or project is worthy of posting. But you know what, we each have our own gifts, and those gifts translate into creating our own style. Sometimes those fancy-smancy houses, filled to perfection with all the latest and greatest are really just houses, not homes. Houses become homes when they are filled with love. I’m older (by far), so I can get on my soapbox every once-in-awhile; but please don’t ever compare yourself or your home to anyone else. You are lovely and so is your home. BTW, I’ve been meaning to tell you how much I like that your dining room is the first room you see when entering your home. Mine is kind of that way, too, but so often our dining rooms are tucked off to themselves and not often seen. Thank you Carol! And yes, the more years we live the more we are allowed on our soapboxes! You blessed me today! Thanks Kimm – I think it’s more knowing what I wanted to get done that makes me want to not share! My walls all need painted and the wingbacks in my living room need slip covers. And my dining table needs a new paint job – at least the top as I’ve used it for paint projects so much it’s not very pretty anymore. But I was happy with my photos and I do love the cozy feel of home! Jill, your home is beautiful. I always love seeing your creativity. Never ever think it isn’t worthy of sharing. It is truly wonderful. I loved everything, but I specifically noticed all your cute little reindeer. Why you are so silly to feel that your home is any less than anyone else’s. Yes it’s not a high-end showplace but there’s something so sweet and innocent about it that it almost makes me cry. I’m so glad you posted it and I’m going to take a good long closer look when I get a chance. I did love that wooden horse and I’ve always loved your shelf. I asked you once a lot of questions about it and thanks for your response. The only one I forgot to ask is: how high is it off the floor? Thank you! It’s home and we do enjoy it! The shelf is 63″ from floor to shelf. Your home is adorable! 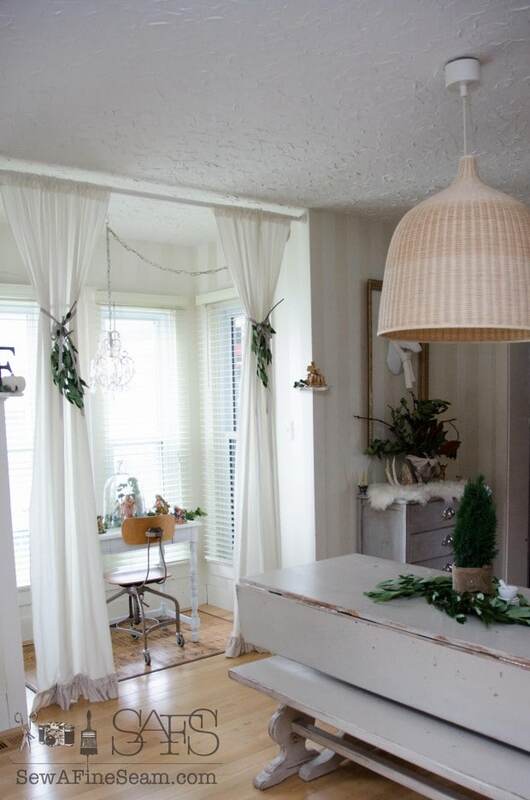 I love all the vintage touches. Hi Jill – I’m so glad I found your blog today. Your home is absolutely charming and I love all your holiday decorations. I especially liked your new wooden horse and the way you strung fairy lights through your curio cabinet – very clever. I’m looking forward to seeing the rest of your tour. 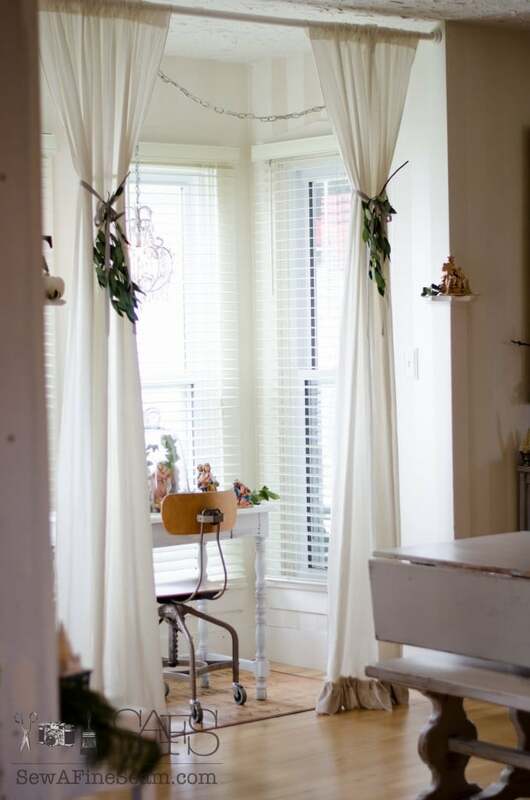 Your home has so much character and sweetness, Jill. It looks so pretty all decorated for Christmas. I have really enjoyed seeing it all! Jill, I am so glad you decided to share your home this year….even if your to-do list hasn’t been completed, it sure looks lovely and warm to me! 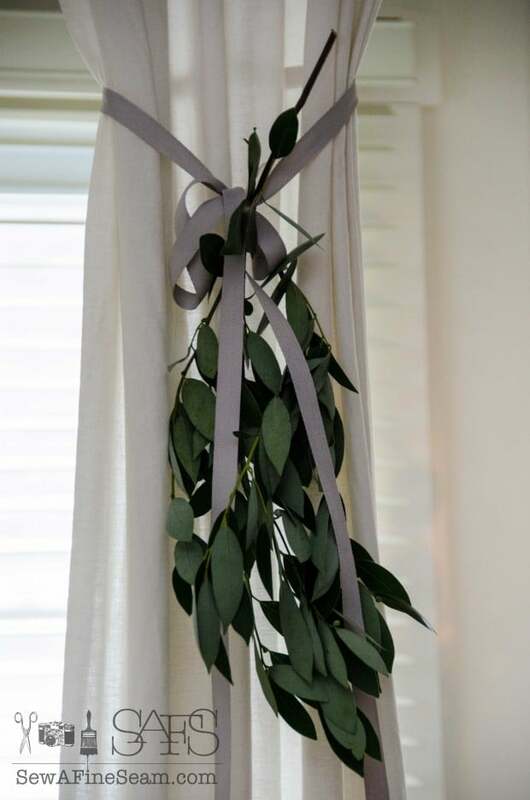 I love your pretty touches like the bay leaf in the curtain ribbon and your husband’s toy truck. It all so genuine and real and festive and I loved taking your tour. 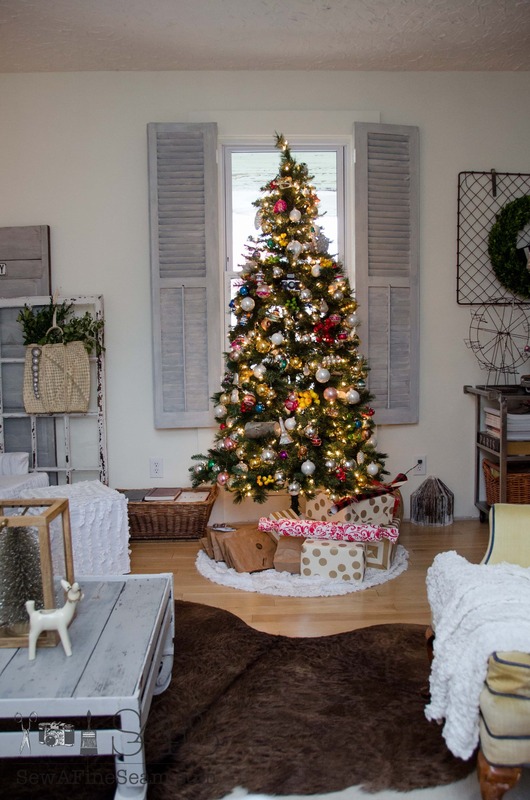 Thank you for sharing your home and Merry Christmas! Thanks Lisa! I’m enjoying the lights and decor and it feels like home so it’s all good! Your home looks warm, welcoming and lovely! 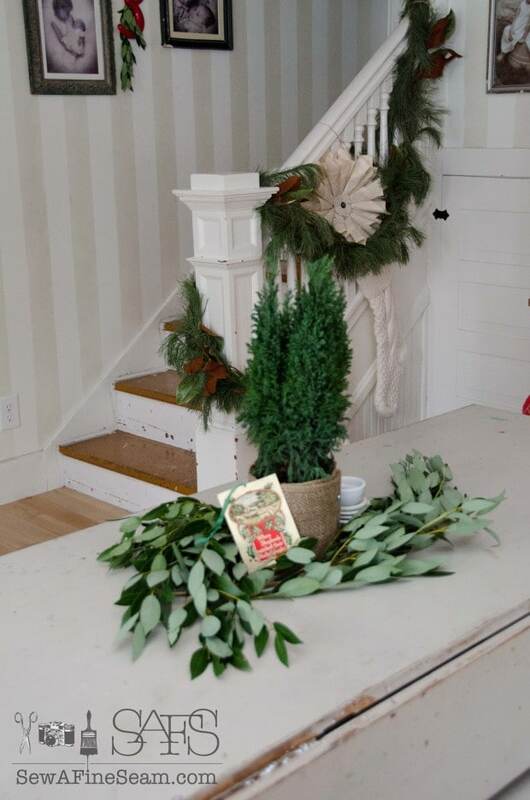 I’m loving the bay leaves you used in so many areas, and how those red lockers are such a great holiday punch of color against all of your other pretty elements. 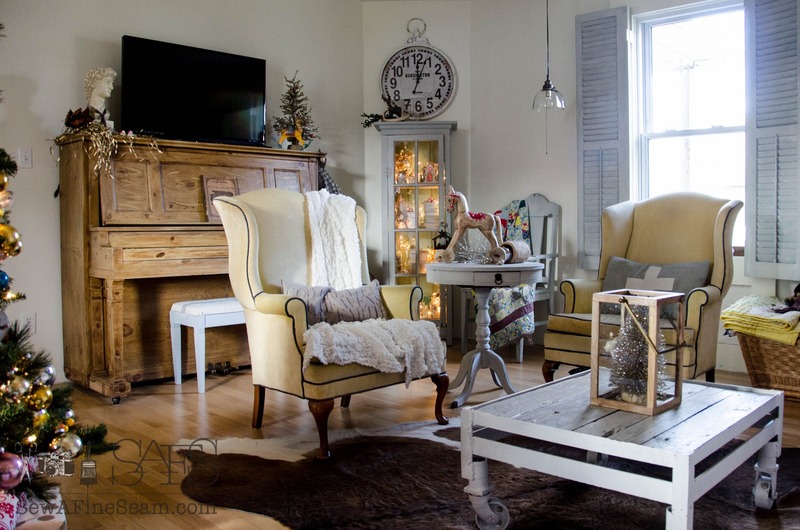 Thanks for linking up to the 12 Days of Christmas Tour of Homes! Merry Christmas!